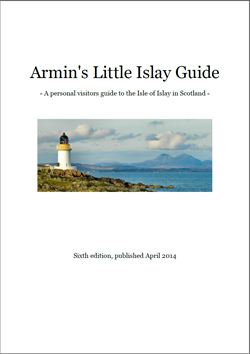 IslayBlog.com —> 2014 —> Armin's Little Islay Guide v6 is out! Armin's Little Islay Guide v6 is out! Well, this took much longer than it should have done, but finally it's done. I've just published the sixth edition of Armin's Little Islay Guide, a printable Islay guide. Hopefully in time for the 2014 Islay holiday season. I had hoped to publish it last year, but then for various reasons never got round to it. So earlier this year I set myself a goal to get it done for this holiday season. There were a few things which went backwards and forwards (like the Islay Natural History Trust centre closing and then not closing at least for now), making some of it fairly tricky. Anyway, I think it's now as good as I can get it for now. This is also the time to thank a few people for their input (and for chasing me), in particular Ian, Irena, Sue, Andrew, James and Rosemary. I've probably missed someone, if I have thank you as well. Also thank you to all the people who have sent me positive feedback about finding the guide helpful, you are a major motivation to keep updating it. That's pretty much all I have for now, you can download the latest version at Armin's Little Islay Guide, a printable Islay guide. If you find any errors, omissions or have any other suggestions for improvements by all means let me know, either via email or in the comments, whatever you're comfortable with. I'm also thinking about adding a few pictures to the next edition, do you think that's a good idea or would you prefer keeping it to just the text as it is now? Either way, I promise I won't wait that long until the next edition.